Firms coping with limited resources are looking outside their walls to maintain their overall trading capabilities. Boston, April 4, 2014 – Markets trade faster than ever before, but overall market conditions have been stagnant at best, and participants are being squeezed by externalities while navigating intense competition. As the institutional trading market continues to quicken, even traditional asset managers, mid-market broker-dealers, and hedge funds are turning to single-digit-millisecond trading infrastructure to remain competitive. But how can they develop and maintain a robust trading infrastructure without breaking the bank … or diverging too far from their core business? 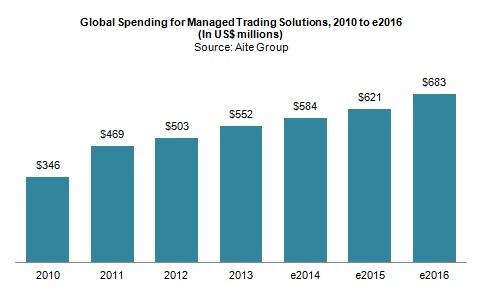 Outsourced managed trading services are proving ideal for many. Based on Aite Group interviews with leading managed trading service providers and buy- and sell-side executives, this Impact Report analyzes key industry trends that are shaping the future of managed trading services and provides insights into some of the challenges and opportunities for future adoption. The study also identifies key components of outsourced managed trading service offerings and analyzes client needs for trading infrastructure support. This 38-page Impact Report contains 18 figures and three tables. Clients of Aite Group's Institutional Securities & Investments service can download this report.